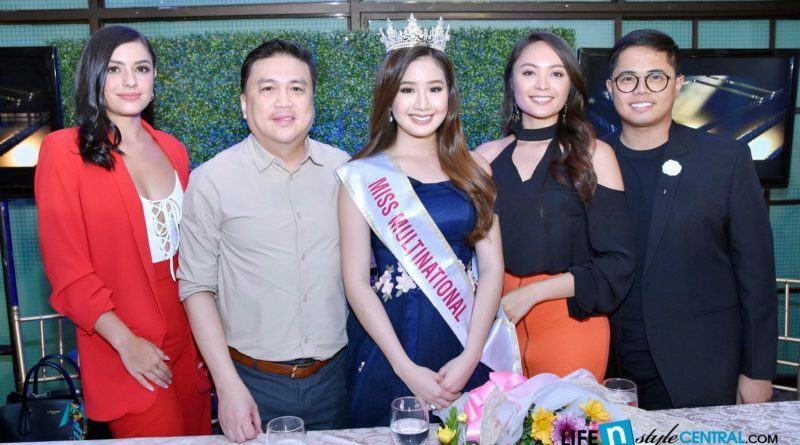 Eight days after Sophia Senoron’s successful campaign in Miss Multinational pageant, the 18-year old newly crowned queen met the members of the press during her homecoming press conference yesterday, March 6, at Annabel’s T. Morato, Garden A Function Room. “Thank you everyone who supported me during my pageant. Sobrang na appreciate ko mga messages sa social media. 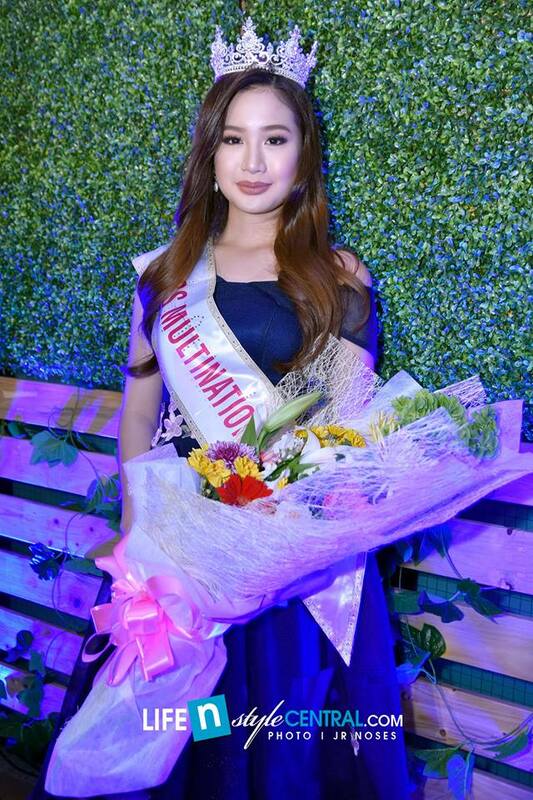 It really helps with my self-esteem and probably would not have done it if I didn’t know na maraming taong sumusuporta sa akin more than the Miss World Pilippines Organization and my MWP sisters but the entire Philippines as well,” Senoron said as she addressed the media. Miss Multinational 2017/2018 Sophia Senoron poses for photograph upon her arrival during her homecoming press conference. Also in attendance during the press conference are the core members of Miss World Philippines (MWP) Organization and some of its reigning queens namely: Arnold Vegafria (National Director), Bessie Bessana (General Manager), Cynthia Thomalla (Miss Eco Philippines 2017) and Glyssa Perez (Miss World Philippines 2017 First Princess). Arnold Vegafria also shared to the media what made Senoron the first ever winner of Miss Multinational pageant. “This is another victory for our country. It was a good experience. I was there when it happened when she was crowned as Miss Multinational. It is a very hard and difficult competition. It is not only beauty pageant. It is more of intelligence. It’s like you are defending a thesis. It’s a defend type of competition,” Vegafria said to the media. “I witness their pre-pageant. All of them are deserving. All of them are beautiful and intelligent but Sophia talaga ang nagpakita ng gilas when it comes to intelligence. The competition is more on question and answer. There are three rounds. And prior to that there is a debate, battle of speech. It’s like a reality show na you don’t know what will happened. The competition is more Q&A, one on one interview and intelligence,” Vegafria added. 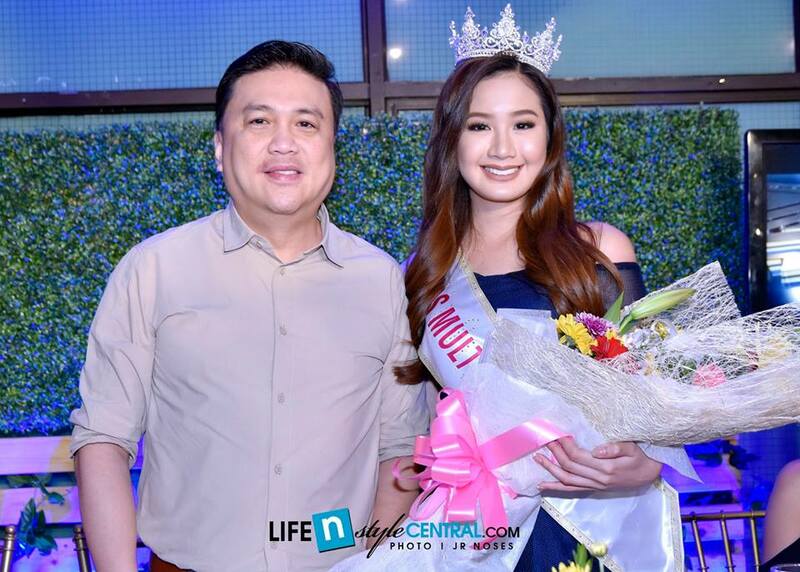 Sophia Senoron with Arnold Vegafria, Miss World Philippines Organization National Director. “The organization is looking for an ambassador to represent the multi racial, multi religion of different countries,” shared Vegafria. Vegafria also thanked the media who supported the MWP Organization and Sophia’s journey to the pageant. “I would like to thank everyone who supported Sophia specially the time na natalo tayo sa social media. Thank you dahil biglang nag top ang Philippines sa social media,” Vegafria addressed to the media. Senoron’s MWP sisters also made their congratulatory piece to the new queen. “I’m very proud of you. Actually during the pageant I was so scared because I had no updates, no live streaming. I’m really proud of you and keep it up,” Miss Eco Philippines 2017 Cynthia Thomalla’s message to Senoron. “Like Cynthia (Thomalla) said, we are very proud of you. You made everyone proud. The fact that you are only 18 and wow I just find it amazing. You are beautiful and intelligent. You have the whole package. I’m so blessed that I’m able to get to know you,” Miss World Philippines 2017 First Princess Glyssa Perez Perez’s special message to Senoron. MWP Sisters. 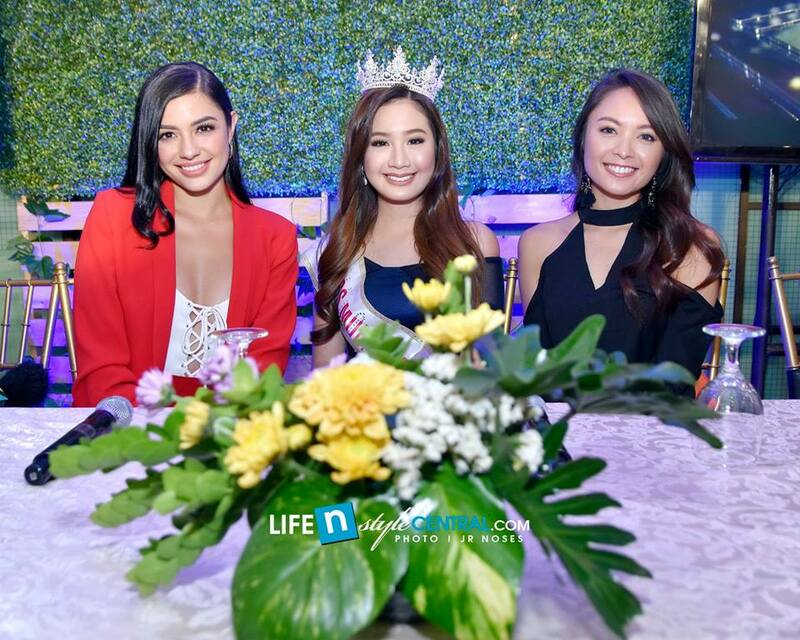 Sophia Senoron with her fellow beauty queen sisters: Cynthia Thomalla (Miss Eco Philippines 2017) and Glyssa Perez Perez (Miss World Philippines 2017 First Princess). Last February 26, Senoron defeated 12 other women competing in the inaugural edition of Miss Multinational pageant in India. Aside from the crown, she also won special awards such as Miss Environment and Miss Speech. She arrived at Ninoy Aquino International Airport (NAIA) Terminal 1 last March 5 via Malaysia Airlines. I as well as my pals appeared to be checking the best guidelines on the blog and then at once got a horrible suspicion I had not expressed respect to the web site owner for those secrets. My ladies are already happy to read through them and have in effect actually been taking pleasure in these things. Thank you for really being simply thoughtful and for using varieties of great resources millions of individuals are really eager to know about. Our honest apologies for not expressing appreciation to you sooner. A lot of thanks for your entire labor on this web page. My mom take interest in doing investigations and it’s really easy to understand why. Most of us know all regarding the powerful way you render functional guidelines via the web blog and therefore recommend response from other individuals on the article so our princess is without a doubt learning so much. Take pleasure in the rest of the new year. You’re the one conducting a really good job. I simply wished to appreciate you once more. I’m not certain what I would’ve implemented in the absence of the type of hints documented by you about such a topic. Entirely was a very scary issue in my view, nevertheless considering the very specialized way you resolved the issue forced me to weep over gladness. I am just happy for this assistance and as well , trust you comprehend what a powerful job that you are putting in teaching the others thru your webblog. I am certain you have never encountered all of us. My wife and i were peaceful that John could round up his analysis through the ideas he acquired out of your web pages. It’s not at all simplistic to simply happen to be releasing strategies that many men and women could have been making money from. We fully grasp we need the blog owner to appreciate for that. The most important illustrations you’ve made, the straightforward website menu, the friendships your site help to create – it’s most fantastic, and it’s aiding our son in addition to our family understand this situation is brilliant, which is tremendously fundamental. Thanks for the whole lot! I would like to show my admiration for your generosity for men and women who absolutely need help with your idea. Your very own dedication to passing the message all through had become really important and has all the time made regular people much like me to get to their pursuits. Your amazing helpful publication signifies so much a person like me and extremely more to my office workers. Thanks a ton; from all of us. I enjoy you because of your entire effort on this website. My mum takes pleasure in participating in research and it’s really simple to grasp why. We hear all of the compelling way you produce rewarding thoughts on your blog and as well as boost contribution from other individuals on the concept while our favorite princess is in fact being taught a lot. Take advantage of the rest of the year. You’re the one carrying out a good job. Needed to create you this bit of remark so as to thank you very much again for your personal magnificent pointers you’ve contributed on this site. It’s quite shockingly open-handed with people like you to make unhampered exactly what a few people might have marketed as an e-book to make some cash on their own, primarily since you might well have done it if you considered necessary. The concepts in addition worked like the easy way to fully grasp someone else have similar passion much like my very own to understand more and more pertaining to this issue. Certainly there are some more enjoyable periods in the future for folks who scan your website. I wanted to compose you the bit of remark so as to thank you as before on your great secrets you’ve provided at this time. It’s so open-handed of you in giving extensively all that many individuals could have offered as an e-book to earn some money for themselves, even more so now that you might have tried it in case you desired. These tricks additionally worked as the good way to understand that some people have similar keenness the same as mine to see a great deal more with regards to this condition. Certainly there are many more pleasurable instances in the future for those who look into your site. I wish to get across my love for your kindness for those individuals that really need assistance with this particular idea. Your real dedication to passing the solution all through had become unbelievably effective and has in every case allowed others like me to attain their ambitions. Your own important facts denotes much a person like me and a whole lot more to my mates. Thanks a lot; from each one of us. Needed to create you a bit of note to be able to say thanks the moment again on the unique tactics you have documented in this article. It was quite tremendously open-handed with people like you to offer easily all a few people would’ve sold as an ebook to help with making some cash on their own, even more so since you could possibly have done it if you ever considered necessary. The points additionally acted like a fantastic way to be certain that many people have the identical desire just as mine to know the truth many more with respect to this problem. I’m sure there are numerous more pleasurable opportunities in the future for many who look over your blog post. Thank you a lot for giving everyone such a spectacular chance to read from this site. It is often very useful and also stuffed with fun for me and my office peers to visit the blog particularly thrice in one week to study the latest guidance you have got. Not to mention, I’m just certainly motivated considering the fantastic suggestions you serve. Selected 2 tips on this page are truly the simplest we have all ever had. Thank you so much for giving everyone remarkably brilliant possiblity to read in detail from this blog. It can be very good and also stuffed with fun for me personally and my office colleagues to visit your site no less than 3 times in 7 days to read through the new things you will have. And of course, I am certainly astounded concerning the impressive principles you serve. Selected 4 tips on this page are completely the very best I’ve ever had. I in addition to my guys ended up taking note of the great key points found on your web site and then suddenly I got a horrible feeling I never expressed respect to the web blog owner for those strategies. Those boys ended up for that reason joyful to see them and already have definitely been loving these things. Appreciate your indeed being so accommodating and then for picking out this form of very good issues millions of individuals are really eager to understand about. My personal sincere regret for not expressing appreciation to you sooner. My husband and i ended up being so peaceful that Jordan could deal with his research by way of the ideas he got while using the web page. It’s not at all simplistic to just happen to be freely giving guidelines which often other folks could have been making money from. And we also consider we have the website owner to be grateful to because of that. Most of the explanations you’ve made, the straightforward blog menu, the relationships your site make it easier to foster – it is mostly astounding, and it’s letting our son in addition to us reckon that this theme is brilliant, and that is pretty indispensable. Thanks for all the pieces!